I Love RVing Because Everyday There Is A New Problem? I love RVing because every day there's a new problem. Like, for one, when we were getting back from our very second trip, about 1 hour into the trip, we started to smell smoke. My first thought was: I'M GONNA DIE!!! Well, it turned out it was the rear camera was burning out! Another thought that came to me was: Oh great. Yup, the best thing ever. Yup. Second trip, rear camera burning out. Just great. I might as well sleep through it. And THAT is why I love RVing. You can tell us why you love RVing HERE. Comments for I Love RVing Because Everyday There Is A New Problem? because a camera burned out? You LOVE the RV lifestyle because the back up camera died on your second trip? Please, tell us some of the high points, the wonderful things you find. What do you hope to see on your next trip? 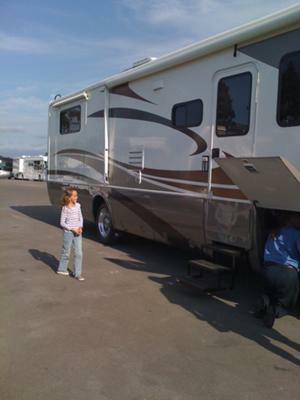 Note From RVing Al Hi Don, The author of this story is Ally the little girl standing next to the motorhome in the picture at the top of this page. So this story is from an 8 or 9 year old's perspective. I think her fun is watching her parents deal with the challenges.